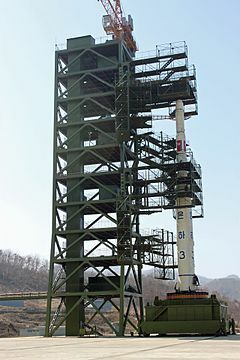 ^ 1.0 1.1 "North Korea begins fuelling controversial satellite",. The Telegraph. 29 March 2012 [13 April 2012]. ^ 2.0 2.1 NORAD and USNORTHCOM Acknowledge Missile Launch. NORAD. 2012年4月12日. （原始内容存档于2012年4月15日）. ^ DPRK to launch satellite next month: KCNA. Chinadaily.com.cn. March 16, 2012. ^ Sang-hun, Choe. North Korea Says It Will Launch Satellite Into Orbit. Nytimes.com. March 16, 2012. ^ 北韓發射火箭 南韓強烈譴責. 中央通訊社. 2012年4月13日. ^ 北韓揮霍無度紀念金日成誕辰百周年. 朝鮮日報中文. 2012年3月20日. （原始内容存档于2015年12月22日）. ^ 15.0 15.1 "North Korea's planned rocket launch raises missile concerns", m&c 互联网档案馆的存檔，存档日期2012-07-20.